Communicate: Start to better understand the body and what it is trying to tell you. Learn ways to communicate better with those around you. Overcome: Learn knowledge, tools, and skillset to help overcome fears, doubts, and low self-esteem. Relate: Enjoy a positive human experience. Live, laugh, love. Empower: Instill the value of the unique self in order to grow the belief in self-worth and ability. Each retreat emphasizes whole body health and includes lifestyle analysis, goal setting, nutrition, local farm to table initiatives, personal fitness abilities, and mindful activities like creative art, music sessions, adaptive yoga, and guided breathing exercises. We incorporate sports and outdoor activities based on the interests and skills of the participants in each retreat. * Activities options are scheduled with skilled Vermont Adaptive staff and volunteers in: canoeing, kayaking, outdoor hiking adventures, therapeutic horseback riding, cycling, swimming, games, and more. The retreat concludes with a family BBQ and celebration of accomplishments. After the retreat, we encourage participants to stay active and involved on a regular basis in Vermont Adaptive programs so we can work together toward longer term healthy lifestyle goals. To participate, contact Tom by email or 802.786.4991. 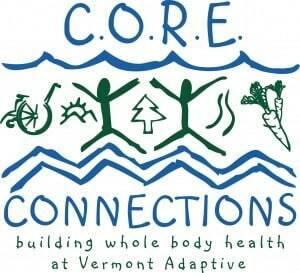 Meanwhile, if you are new to Vermont Adaptive, create your profile to begin the registration process for an upcoming retreat.